UArctic, ACU, AUCC, IAU, U Sports, AUFSC, CBIE. The University of Northern British Columbia (UNBC) is a small, research-intensive university, the main campus of which is located in Prince George, British Columbia. UNBC also has regional campuses in the northern British Columbia cities of Prince Rupert, Terrace, Quesnel, and Fort St. John. The enabling legislation is the University of Northern British Columbia Act 1996. In the 2013-2014 academic year, 4,020 students were enrolled at UNBC. In 2015 and, 2016 UNBC was ranked as the number one university of its size in Canada in the Primarily Undergraduate category by Maclean's Magazine. As of 2017, UNBC has been ranked in the top three in its category for 10 straight years. In 2007, the university obtained the trademark for "Canada's Green University". Because of its northern latitude, UNBC is a member of the University of the Arctic. 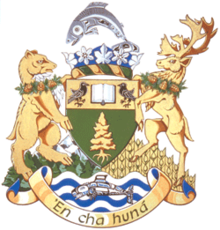 The British Columbia legislature passed Bill 40 (the UNBC Act), which formally established the university, on June 22, 1990 The university was established in response to a grass-roots movement spearheaded by the Interior University Society. UNBC offered a limited number of courses in rented office space in 1992 and 1993 but was opened officially by Queen Elizabeth II, with 1,500 students, in 1994 with the completion of the main Prince George campus after two years of construction. The university gained attention with the introduction of the Northern Medical Program (NMP), a collaboration between UBC and UNBC. Through this collaboration, several academic physicians have been attracted to the city, which has led to an emerging academic medical community. For example, the introduction of the BC Cancer Agency's Centre for the North has attracted academic oncologists, such as Dr. Robert Olson. The governance was modelled on the provincial University of Toronto Act 1906, which established a bicameral system of university government comprising a Senate (composed of members of the faculty), responsible for academic policy, and a Board of Governors (composed of members of the community), which exercises exclusive control over financial policy and having formal authority in all other matters. The President, appointed by the board, was to provide a link between the two bodies and to perform institutional leadership. Dr. Daniel Weeks is the current President. The Prince George campus is located on Cranbrook Hill, overlooking the city of Prince George from the west, and is widely renowned for its innovative architecture. The separate buildings are linked by an agora that is partially below ground level. It is the efficient heating system connected to all the core campus buildings that permits UNBC to pursue its goal of heating the university by the gasification of clean-burning, renewable wood pellets, collected from the waste of pine trees killed by the mountain pine beetle epidemic. UNBC's buildings are designed to represent the northern landscape. The "Winter Garden" area has a flowing blue staircase below a ceiling of wooden lattices, representing the west-coast rain forests. The cafeteria has a lighthouse design representative of the North's rugged coastline. There are also other structures, such as triangular glass peaks, that represent mountains and act as sky-lights for the UNBC Bookstore. On October 13, 2010, UNBC was co-awarded the Campus Sustainability Leadership Award by the Association for the Advancement of Sustainability in Higher Education (AASHE) for its bio-energy project, which targets a reduction in fossil fuel use by supplying 85% of UNBC's heating needs. The University Hospital of Northern British Columbia is a largest Level III trauma centre in Northern BC. UNBC's motto 'En cha huná literally means "He/she also lives." in the Nak'azdli (Fort St. James) dialect of Carrier. It is interpreted as "respecting all forms of life." The Northern Undergraduate Student Society, known colloquially as NUGSS, represents the undergraduate student body at the University of Northern British Columbia. A non-profit organization, NUGSS serves and represents all undergraduate students at all UNBC campuses. The Society governs student-led organizations (SLOs) on campus, provides the health and dental plan, advocates for student needs in local transit, and hosts various events. Annual NUGSS events include Backyard BBQ, Jump Back to NYE, and Final Affair. The Northern British Columbia Graduate Student Society (NBCGSS), represents about 750 full-time and part-time graduate students. It was founded in the year of 1997, less than a decade after UNBC was founded.Every year NBCGSS holds events like winter/semi formals, a ski trip and a summer trip. NBCGSS is a member of the Canadian Federation of Students (CFS). The UNBC First Nations Centre provides support services for aboriginal students, including bringing in elders, counselling, and events such as talking circles and sweat lodges. The Northern Pride Centre Society or (also known as the "PC") offers a safe space, support, and resources to the LGBT and ally community, including a new Positive Space Campaign designed by UNBC students. A weekly University Farmers' Market (UFM) is held from September to April in the Northern University Student Centre (NUSC). The UFM is a collaborative project between multiple stakeholders within the university including NUGSS, faculty, staff, students, Students for a Green University and the Prince George Public Interest Research Group. This innovative project provides easily accessible local foods onto campus and brings UNBC populations together (faculty, staff and students) in a social atmosphere. Over the Edge, a bi-weekly student newspaper. Established in 1994. CFUR 88.7fm, the independent community-campus radio station. The Timberwolves compete in the Canada West Universities Athletic Association. UNBC fields men's and women's teams in soccer and basketball. ^ "Captcha". canlii.org. Retrieved 18 April 2018. ^ "Our Students - University of Northern British Columbia". www.unbc.ca. Retrieved 18 April 2018. ^ "Best of the best: Introducing the 2016 Maclean's University Rankings". macleans.ca. ^ "UNBC is Canada's Green University - University of Northern British Columbia". www.unbc.ca. Retrieved 18 April 2018. ^ "UNBC History - University of Northern British Columbia". www.unbc.ca. Retrieved 18 April 2018. ^ British Columbia Archives. "Chronology of Principal Royal Visits to British Columbia". Queen's Printer for British Columbia. Archived from the original on 28 February 2009. Retrieved 25 June 2009. ^ Olson, Robert; Brastianos P; Palma D. (2011). "Prognostic and predictive value of epigenetic silencing of MGMT in patients with high grade gliomas: A systematic review and meta-analysis". Journal of Neuro-Oncology. doi:10.1007/s11060-011-0594-5. ^ Olson, Robert; Iverson G; Carolan H; Parkinson M; Brooks B; McKenzie M (2011). "Prospective comparison of two cognitive screening tests: Diagnostic accuracy and correlation with community integration and quality of life". Journal of Neuro-Oncology. doi:10.1007/s11060-011-0595-4. ^ Olson, Robert (2011). "Selection bias potentially overestimates risk of breast pain from radiotherapy". Radiotherapy & Oncology. ^ Caon, Julianna; Olson R; Tyldesley S; Bergman A; Bobinski M; Fong M; Ma V; Vellani R; Goddard K (2011). ". Assessing the risk of inadvertent radiation exposure of pregnant patients during radiation rtherapy planning and treatment in British Columbia". Practical Radiation Oncology. ^ Olson, Robert; Bobinski MA; Ho A; Goddard K (2011). "Oncologists' views of informed consent and shared decision making in paediatric radiation oncology". Radiotherapy & Oncology. ^ Olson, Robert; Caron N; Olivotto I; Speers C; Chia S; Davidson A; Coldman A; Nichol A; Bajdik C; Tyldesley S (2011). "Population based comparison of breast cancer screening and treatment utilization by health care region in a Canadian province". Canadian Journal of Public Health. ^ "Organizational Structure - University of Northern British Columbia". www.unbc.ca. Retrieved 18 April 2018. ^ UNBC Wins AASHE Award. Opinion250.com (2010-10-12). Retrieved on 2013-08-12. ^ "About the University of Northern British Columbia - University of Northern British Columbia". www.unbc.ca. Retrieved 18 April 2018. ^ "About: Member Students' Unions". BC Federation of Students. Retrieved April 17, 2019. ^ "University Farmers' Market". University of Northern British Columbia. Retrieved April 17, 2019. ^ "Prince George Public Interest Research Group". Retrieved April 17, 2019. Charles J. McCaffray (1995). UNBC, a Northern Crusade: The how and who of B.C. 's Northern University. Duncan, British Columbia: the author. ISBN 0-9680300-0-9. Wikimedia Commons has media related to University of Northern British Columbia.